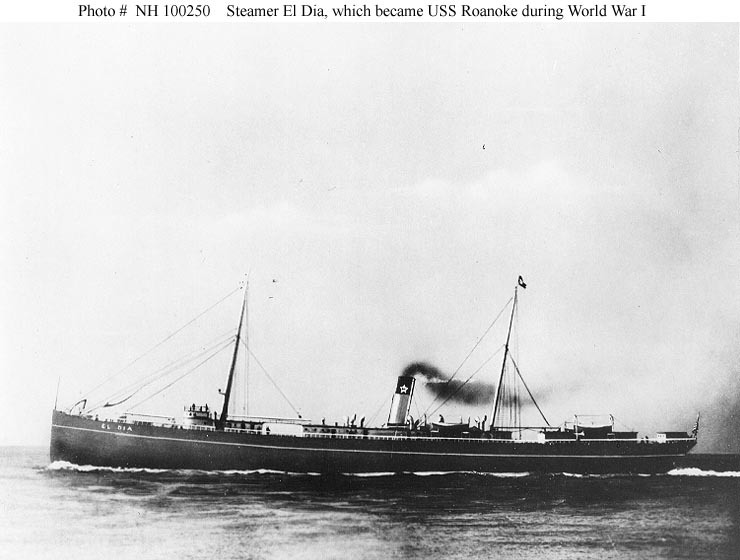 El Dia, a 7620-ton steamship, was one of a series of passenger-cargo ships built by the Newport News Shipbuilding and Dry Dock Company, Newport News, Virginia, for the Southern Pacific Company. Launched in May 1901, she was delivered four months later and began a career of merchant service between New York, New Orleans and Galveston that lasted until 1917, when she was taken over by the Navy for World War I service. Converted to a minelayer, she served as USS Roanoke (ID # 1695) until 1919, when she was returned to her owners. This page features all available views of the passenger-cargo ship El Dia. Artwork, photographed by E.P. Griffith, Newport News, Virginia, showing her in merchant service prior to World War I. This ship was acquired by the Navy for use as a mine planter, renamed Roanoke (ID # 1695) on 15 November 1917, and commissioned on 25 January 1918. She was returned to her owner on 30 August 1919. The original is in National Archives' Record Group 19-LCM.